Hazardous Level: Bed Bugs feed off you in your sleep. They cause anxiety and insomnia. Furthermore, there is a stigma of shame and embarrassment attached as people think you are unhygienic (even though hygiene really has nothing to do with bed bugs. Multiplication Level: 2-5 Bed bug eggs are laid by each bed bud per day. Bed bug infestations have been reported in homes, apartments, hotels, motels, health institutions, shelters, student and senior citizens residences and libraries. How do I recognize a Bed bug? The scientific name for bed bugs is Cimex lectularious. 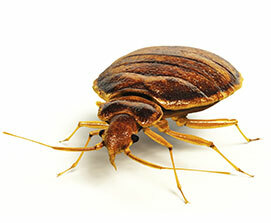 A bed bug is flat, oval shaped, brownish and wingless that can range from 4-7mm long. The female is rounder and the male is longer. What causes Bed bugs to spread? - Greater movement of individuals (moving, tourism, etc.) - Use of second hand objects (furniture and clothing) - Lack of knowledge about bed bugs has led to implementation of ineffective extermination methods. Bed bugs feed at night on human blood. They feed every 3 to 7 days. They are attracted by vibrations, heat, odours and carbon dioxide released by an individual. Female adults lay 2 to 5 eggs a day (300 to 500 eggs over their lifetime) There are three main stages of development in the bed bugs life cycles: - Egg: white, one millimeter long, hatches in 10 to 14 days. The eggs are deposited in clusters in a variety of locations (cracks and crevices, along walls and below baseboards, etc) - Nymph: Looks like an adult insect but smaller, nymphs feed on blood but are most vulnerable if they don’t feed. Nymphs turn into adults in about one month. - Adult: Life span is about 6 months if it feeds regularly. However an adult can survive in a dormant state for over a year if they don’t feed. The first sign that there is bed bugs in a home are bites on the skin. Bed bugs will bite arms and legs or any exposed skin during the night is likely to get bitten. Bites or lesions are often clustered in groups of 3 or 4 and look like mosquito bites. Bed bug bites can be extremely itchy. It is recommended that you seek the services of a qualified Pest Control professional to eliminate pests for thorough results. Bed bugs are extremely difficult to get rid. The city of Hamilton has recently spent half a million trying to get rid of bedbugs as they are worried of it becoming an epidemic.